Tender sour cream coffee cake, ribboned with cinnamon and topped with a crumbly streusel topping. 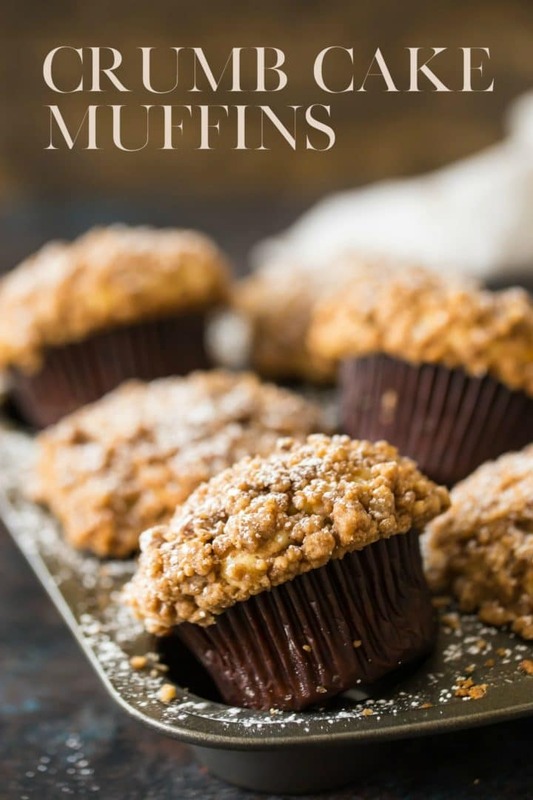 These crumb cake muffins are a great way to start the day! Don’t you just love crumb cake? I mean anything with crumb topping really. Those big, chunky hunks of buttery streusel are just so irresistible to me! There are a lot of crumb topped recipes here on Baking a Moment. I’m talking cinnamon coffee cake, crumb donuts, blueberry muffins… the list goes on and on. But for today’s recipe I’m keeping it really simple. Just a tender, moist sour cream cake, with plenty of cinnamon-spiced crumbly-crumbs in every bite. It’s perfection, in convenient, individually portioned crumb cake muffin form. 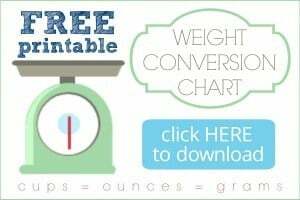 So nice for breakfast, brunch, or as an afternoon snack! WHAT ARE CRUMB CAKE MUFFINS? New York Crumb Cake is a beloved morning or afternoon snack. It consists of a tender sour cream based cake, topped with a thick layer of crumbly cinnamon streusel. Crumb cake is sometimes also known as “coffee cake.” Not because it contains coffee or tastes like coffee, but because it is so often served with coffee. This is the muffin version! Just like the original cake, these muffins are moist and tender, with plenty of buttery crumble on top. To make these muffins, it’s best to start with the topping. It’s as easy as tossing melted butter, flour, brown sugar, cinnamon and salt together with a fork. This is my FAVORITE crumb topping. If you want to learn more about it (including different ways it can be adapted), click here: Basic Streusel Recipe. Once the topping is made, you can get going on the cake component of these muffins. Place your dry ingredients into a big bowl: flour, sugar, baking powder, and salt. Give them a quick whisk just to combine everything. In a smaller bowl, stir melted butter, sour cream, eggs, milk, and vanilla together until smooth. Pour the sour cream mixture into the dry ingredients, and fold gently until just barely combined. It might seem really dry at first, but if you just keep folding it will come together. The batter will be very thick and stiff- this is how you know your muffins are going to bake up nice and tall! It’s totally ok if it seems a little lumpy! In fact, it’s preferable. The less you stir the batter, the more tender your crumb muffins will be. Fill the wells of your muffin pan just a little less than half full, and then sprinkle a little of your crumb topping on. Then, layer more of the sour cream cake batter on top. Another layer of streusel and into the oven they go! 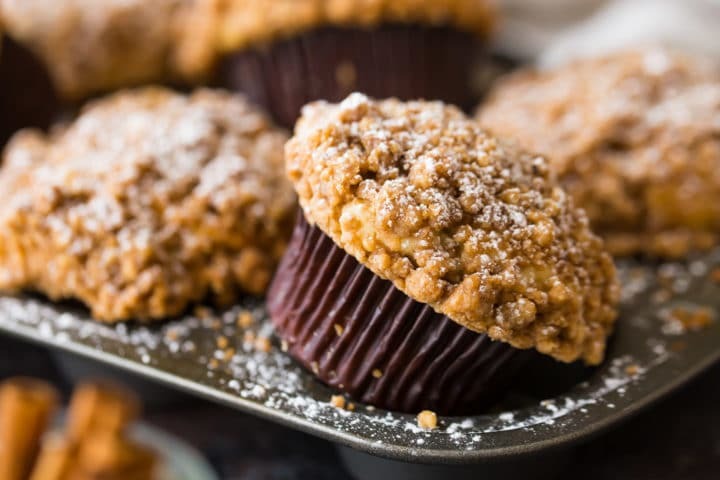 You’ll know your crumb cake muffins are done when a toothpick inserted in the thickest part of a muffin comes out clean or with a few moist crumbs. 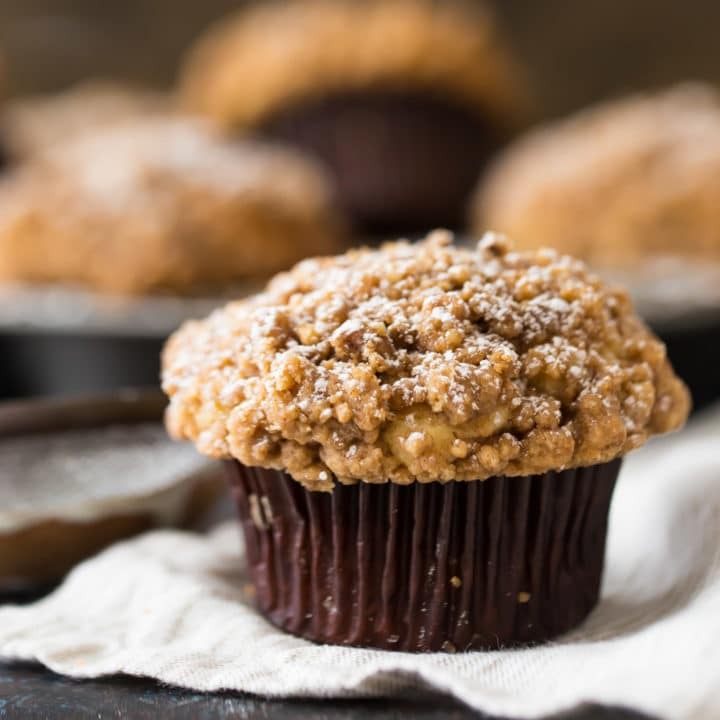 Storing muffins can be a little tricky, especially when crumb topping is involved. 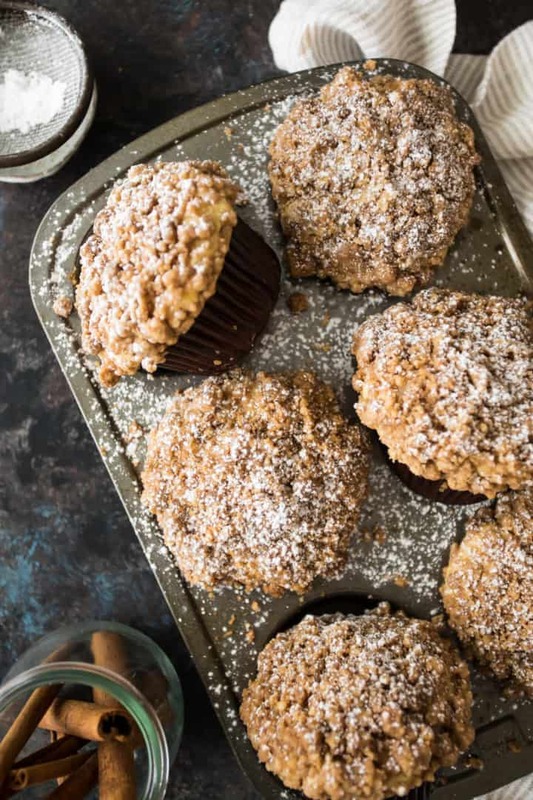 You want to keep the muffins from drying out, but on the other hand, the streusel can become soggy. I think the best way is to keep them in the muffin pan, and place plastic wrap loosely on top. This way, the bottom half of the muffin is enclosed, but the tops can still get a little air. The crumb cake muffins will keep for a couple of days (at room temperature) this way. Maybe up to a week in the fridge. Or, you can freeze them! I actually love storing muffins in this way. Just place them in a zip-top bag, and they’ll be good in the freezer for at least a month. When you’re ready to enjoy one, just thaw it at room temperature or pop it in the microwave for about 20 seconds. I hope you’ll give these crumb muffins a try! They’re such a treat with a nice, hot cup of coffee or tea! Toss the melted butter, flour, brown sugar, cinnamon, and salt together with a fork until crumbly. Preheat the oven to 425 degrees F and line a muffin pan with papers. Place the flour, sugar, baking powder, and salt in a large bowl and whisk to combine. In a smaller bowl, whisk the melted butter, sour cream, milk, eggs, and vanilla together until smooth. Add the sour cream mixture to the dry ingredients, and fold together until just barely combined. Fill the wells of the muffin pan halfway with the sour cream coffee cake batter, then top with a few teaspoons of the cinnamon crumb topping. Divide the remaining batter equally among all 12 wells of the muffin pan, and top with the remaining cinnamon crumb topping. Bake the crumb cake muffins for 5 minutes at 425 degrees F, then turn the oven temperature down to 350 degrees F and continue to bake for 14 to 18 minutes, or until a toothpick inserted in the thickest part of a muffin comes out clean or with a few moist crumbs. That crumb topping pushes these yummy muffins over the top!! Are the baking instructions the same if i wanted to make a loaf? Hi Emily! No they would not be the same since a loaf is much bigger than a muffin. You’ll need to bake the recipe much longer in a loaf pan. I would estimate around 60 to 75 minutes at 350. You’ll know it’s done when a toothpick inserted in the thickest part comes out clean or with a few moist crumbs. Good luck! Yum! What a tasty breakfast! Anything with crumb topping just seems celebratory! These muffins look so so good!!! Such an amazing recipe! I made these today but the crumb top didn’t stick and most of it fell off while baking in the oven. Any advise please? Hey Anna! It does tend to do that a little bit, but you can just press it back into place a bit and it should stay. Thanks for trying the recipe! Hope you enjoyed! And thank you for this recipe the muffins were delicious!! My pleasure Anna! I’m so happy you liked them! There is something so enticing about crumb toppings on cakes, pies, and muffins. These look truly delicious! I would not recommend it, as self-rising flour contains additional salt and leavening. Muffin is one my favourite dish. It is a great recipe nicely explained. Pictures are mouth watering. Today I will try this recipe. I already prepared muffins but crumb muffins is something new for me. So happy you like the idea Neha! Enjoy the muffins!